A man rides his bike in a buffered bike lane. The city has introduced several new programs, such as the “Let’s Roll Together” campaign, to encourage safe biking. As the temperature heats up and bike season approaches, Evanston officials are stressing cycling education to reduce the number of bike-related tickets and accidents. The city has dedicated this month to promoting bike safety and education. While May was designated as “Bike Kick-off Month,” the city and community partners launched a citywide “Let’s Roll Together” campaign — which will continue through the summer — to encourage safe traffic behavior among cyclists, drivers and pedestrians. Last year, 78 bike accidents occurred in the city, Evanston police Cmdr. Joseph Dugan said. As of the beginning of May 2015, there have been 10 accidents so far this year, he said. Dugan said residents have responded well to the start of the “Let’s Roll Together” campaign, but emphasized that summer is a busier season in terms of bike-related accidents and theft. However, he said the Evanston Police Department is constantly working to monitor and prevent those types of problems. “It’s always something that we deploy for, and it’s always on our agenda, especially during these months,” he said. Ylda Capriccioso, the city’s intergovernmental affairs coordinator, said Evanston chose May to start providing information and resources on bike safety to coincide with National Bike Month and the beginning of the traditional bike season. As part of the campaign, city staff, community volunteers and EPD officers distributed Evanston bike maps and safety information to drivers, bicyclists and pedestrians at four intersections in Evanston. The city also created a new website, which contains a 2015 bike map, bike registration, safety tips and videos to educate residents further about biking throughout the city. Tom Witt, treasurer and board member of the Evanston Bicycling Club, said the new website is a positive step for the city. Although Witt acknowledges the city has improved cycling conditions, he said Evanston still faces safety concerns and complaints it needs to address. “A real irritant for the folks who run the city and for many people who encounter cyclists is the fact that the prohibition against riding on sidewalks in downtown Evanston is still flaunted quite a bit,” Witt said. 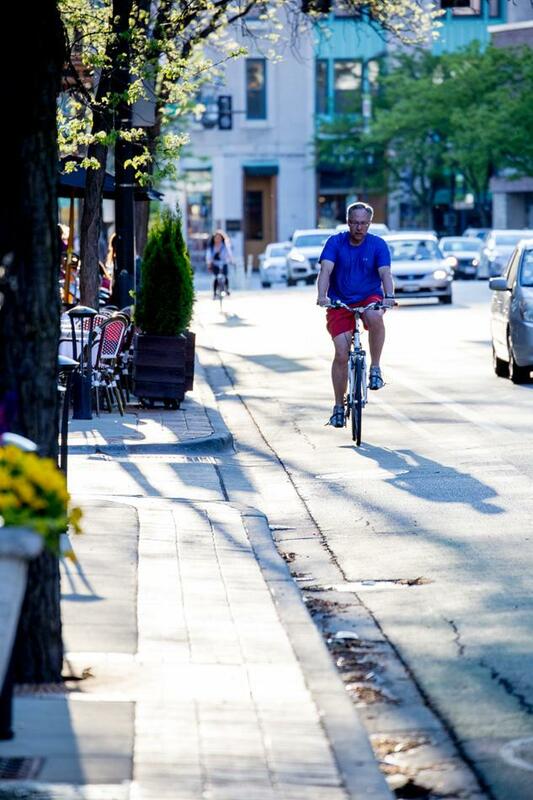 A city ordinance prohibits bike riding on sidewalks in downtown Evanston, as well as other areas where signs specifically state sidewalk riding is not permitted. The fine for violating the ordinance is $25. Witt said some community members believe Northwestern students are the main group of people who ignore the ordinance. In response, NU students should be proactive and change that behavior, he said. “That would be one thing Northwestern (students) could do to contribute to greater acceptance of folks using bikes,” Witt said. Along with police officers and city staff, local community groups and businesses are also involved in May’s bike kickoff campaign. Lou Kuhn, owner of local bike store The Pony Shop, 1224 Chicago Ave., said he thinks the city is moving in the right direction by posting signs in downtown Evanston reminding cyclists to not ride on sidewalks. “That kind of education really helps, and kind of continuing that really is what I would like to see most from the city,” he said. In September 2014, City Council approved plans to delay implementing protected bike lanes on Sheridan Road and Chicago Avenue through NU’s campus. Wagner said residents have told her they want more bike lanes across the city. Witt said, although he cannot necessarily speak for all of the Evanston Bicycling Club, the members are committed to helping the city promote cycling’s environmental and economical benefits. Community group leaders said the “Let’s Roll Together” campaign is a great starting point, but it should not be the end of bike safety and awareness efforts. “It’s a work in progress in Evanston, but I’m encouraged by what the city has done so far,” Witt said.